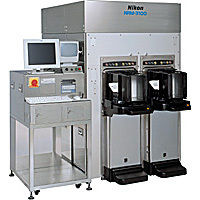 Consolidating Nikon's advanced technology and experience in semiconductor photolithography field, as demonstrated by the NSR series, the NRM overlay measurement systems are high-precision, highly functional measuring instruments that support leading-edge lithography. SMP mark (Self Measurement Program Mark) enables high-precision, high-speed auto-measurement of the stepper's focusing; the NRM Overlay Measurement System contributes to process management of the most advanced devices. *Equipped with high-precision dedicated optical system, optical aberration is strictly managed in the components and assembly production process. Objective lenses have also been specially designed for Overlay Measurement. In addition, Nikon's exclusive high-S/N and high dynamic range imaging system satisfies the high precised requirement from state-of-the-art lithography. *Accuracy of the stage positioning has been dramatically improved by increasing rigidity. EGA, Enhanced Global Alignment, contributes to have higher alignment precision. Wafer exchange time has also been shortened, achieving high throughput of 150 wafers per hour (5 points/wafer). * Offers the world's highest COO. * Equipped with user-friendly software to minimize the time required for creating recipes. These recipes are fully compatible with other Nikon NRM systems. * Provides a stepper management system benefiting from considerable Nikon expertise. The set-up system, data processing system, and output formats are all compliant with the Automatic Measurement System (AMS) of the NSR series. Customer's productivity is significantly improved by replacing the stepper's AMS with the NRM-1000A/3100. Of course, non-Nikon steppers can also be supported by NRM-1000A/3100.